and excited about lessons to be imparted and learnt during the course! Global Industry Advisory Forum(GIAF), aninitiative of IUCEE which began with a small group of Industry Teaching Fellows (ITF), gained momentum during the Second IUCEE Leadership Summit at Goa in July 2018. SCALE a student organization, partner of IUCEE has begun its recruitment for selecting young and enthusiastic facilitators for the year 2019-20. The recruitment would be held for engineering students who are currently in their curriculum from 1st to 3rd year irrespective of their stream of engineering. The last date to submit the application is 24th March 2019. The selected candidates will also undergo a training session both in person and online from the SCALE National Team. Be a part of the leading Engineering Education Student Organization in India and get to facilitate for Regional, National & International workshops. 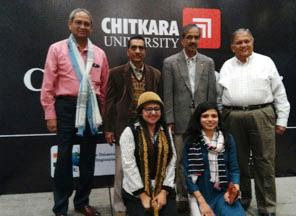 ICTIEEwas held on Jan 7,8 at Malla Reddy Engineering College (MREC) in Hyderabad and on Jan 10, 11 at Chitkara University, Chandigarh. A total of 1200 delegates attended, 230 papers were presented and 40 international experts participated in keynotes and panel sessions. SCALEconducted its Annual Student Conference on Jan 4 to 7, 2019 at CMR College of Engineering and Technology, Hyderabad, prior to ICTIEE 2019. 160 students from all over India participated in leadership development activities. WEEF the annual conference of IFEES (International Federation of Engineering Education Societies) will be hosted at Vellore Institute of Technology, Chennai from Nov 13 to 16. More than 1000 delegates are expected to participate from around the world. Papers will be presented and Keynotes talks delivered on the theme of “Disruptions in Engineering Education for a Sustainable World”. Call for Papers and other details are at http://weef2019.org/. Around 20 IUCEE colleges are now planning to submit proposals for starting the program at their institutions.